I very much welcome this opportunity to meet with members of Pi Capital. 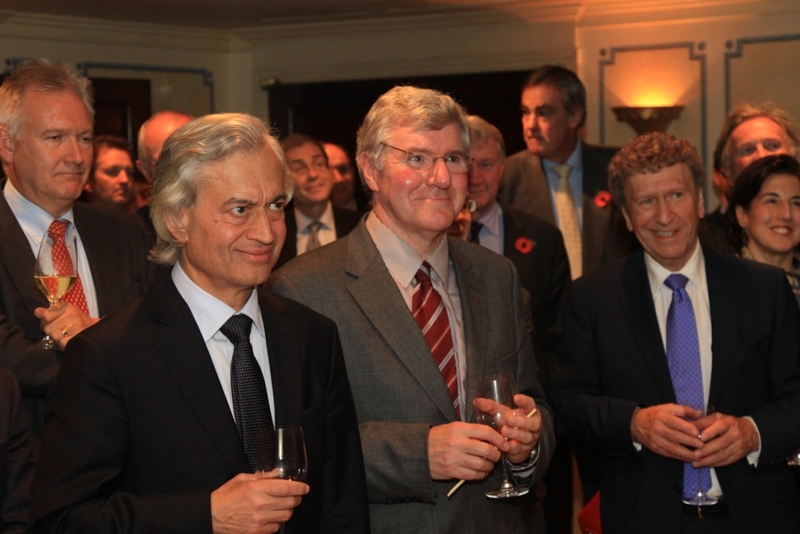 I have learned that Pi Capital members are some of the UK's most successful and influential business leaders. I gather that Pi members sit on over 600 boards and their combined expertise covers all major UK industries and service sectors. 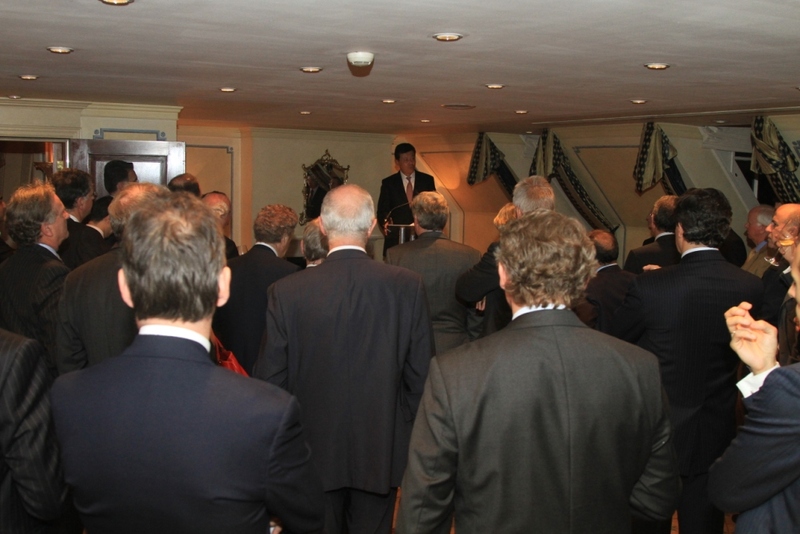 Given this eminent audience I see this evening as a good opportunity to build understanding of the immense opportunities of ties between China and Britain. You have kindly invited me to address the topic of 'Invest in China'. But perhaps you will allow me to adjust the direction of my speech. I feel sure as investors you will welcome a new angle of opportunity! So in the first part of my speech I will move your thinking from 'Invest in China' to a new direction of 'Invest in Britain'. This new way of thinking is underway. For example, recently, I wrote the foreword for the second issue of China in Britain published by the China-Britain Business Council. 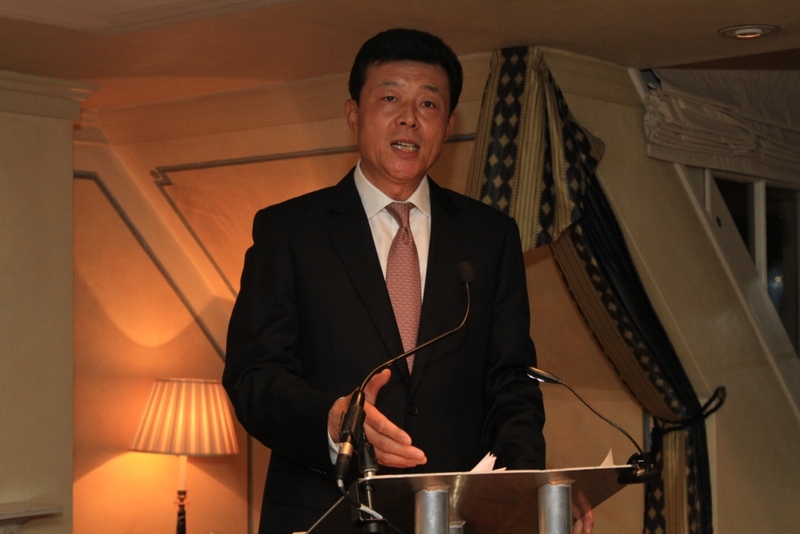 And yesterday, the China-UK Infrastructure Investment Conference was held in London. This was an initiative that sprung from discussions last June between Premier Wen Jiabao and Prime Minister David Cameron. The Conference yesterday explored investment opportunities in energy, railway and other infrastructure projects and brought together Chinese and British financiers and business leaders. · We must commit to build a win-win partnership. · We need to harness our respective strengths in finance, technology and managerial expertise. · And we must create better conditions for two-way investment. As investors you will know that China has accumulated the world's largest foreign exchange reserves. This is the achievement won from over thirty years of opening up and reform in China. These financial reserves mean that China's outward investment is rising quickly. Last year we became the world's fifth largest outward investor, with a net outflow of investment reaching 68.8 billion US dollars. Does China need and welcome more inward investment? Premier Wen then continued: 'We will combine absorbing foreign investment with investing abroad in an effort to enlarge the room for economic development'. That is why China will keep the door open to foreign capital. Also China's pro-investment policy promises more opportunities for foreign investors. You will be aware how China has changed during the past three decades. So it is important to recognise how the Chinese economy and market conditions are evolving. For example China is quite different today than in the early days of the reform and opening up thirty years ago. As I speak, companies from over 190 countries and regions have investment in China. These include over 30,000 from America and more than 20,000 from Europe. And 480 of the top 500 multinationals have operations in China. Big companies are quick to gain foothold on the Chinese market and are reinforcing their positions. With this comes stiffer market competition. To invest successfully, investors must be aware of the general trends in China and seize the opportunities. 'A leader must know the larger picture before taking a specific decision. So what are the general trends investors going to China need to know? The first such trend I bring to your attention is about China's economy. China's strong growth momentum raises the prospect of higher investment returns. The medium to long term trend is the best proof of China's economic vitality and potential. · China will continue to industrialize and urbanize. · Chinese per capita GDP and consumption is going up. · And our technology innovation and workforce quality will further improve. All this means China has strong internal demand to unleash and its growth drivers may get increasingly powerful. Although China's long run economic fundamentals are strong, it appears what catch people's eye is the near-term dynamics. It is true that domestic and global strains have led to the unbalanced, uncoordinated and unsustainable aspects of the Chinese economy. Premier Wen has repeatedly stressed this point and the steps being taken to make appropriate adjustments. These structural imbalances have given rise to some new risks and challenges. Making news headlines here in Britain these days are China's rising inflation, corporate liquidity tightening, local government debts and property bubbles. I understand such concerns are not without reason. But all these challenges are manageable and can be effectively addressed. It is clear to informed observers of China that there is no significant risk of 'hard landing' at this moment. Let us take the issue of inflation. To control inflation, the Chinese government has taken decisive actions and the policy effects have started to kick in. China's PPI and CPI have slowed to 5 percent and 5.5 percent in October and are on course to fall further in the last two months of this year. This means that full-year inflation may still be under 5 percent. Another matter is the issue of funding for business. To help small and medium sized enterprises, the Chinese government has announced nine measures to improve their access to credit and bring order to non-governmental finance. Then there is the widespread comment on local government debt. On local government debt burdens, I must say they remain at the safe and sustainable levels and the local governments are still able to service their debts. On the growth of the Chinese economy, this is close to the planned targets this year. Overall, the Chinese economic growth has moderated to 9.4 percent year-on-year in the first three quarters this year. Considering the global picture and how other economies are doing, we still have every reason to be proud of this remarkable figure. Let me move on to the second trend, China's commitment to further opening-up. China's reform and opening-up kicked off in 1978. Since then China's economic output has jumped from the world's 15th place to become the second largest. Another measure of progress is how China has moved up global trade rankings from the 32nd to number two. In addition, our foreign exchange reserves have increased from 167 million dollars to more than 3 trillion. All these achievements were only possible with China's deeper and wider openness to the outside world. Going forward, China will stay committed to the win-win opening policy. This year, we unveiled the 12th Five-Year Plan, which laid out a more pro-active strategy to deepen our opening-up. · We will further open up the services sector. This means China will advance the reform of the Renminbi exchange rate regime, promote its cross-border use, and gradually move toward capital account convertibility. · China is adopting a more balanced opening-up strategy tailored to various regions. You will see how this will develop a new competitive edge in the eastern seaboard, and at the same time encourage wider opening-up in western China. The aim is that the western region can better leverage its rich resources and skilled workers. · In addition to the economic sectors, China commits to further open up its educational, scientific, cultural and health sectors, to bring more benefits to the Chinese society. To sum up, China will be better served by a deepening of the opening policy. And the whole world will be better off. Being aware of these two positive trends in China is the first step to build investor confidence. But to draw up a winning strategy, you need to know where the opportunities are and how to seize them. Now, let me say a few things about the opportunities China can offer. First, opportunities from economic restructuring. As a first step it is prudent to make a very close analysis of the 12th Five Year Plan. It was telling that there was quite limited British media coverage of the publication earlier this year. Those that dismiss the Chinese Five Year Plans as unimportant 'State Planning' will fundamentally misunderstand the Chinese economy and overlook key signals for investment opportunities. Under the guidance of the 12th Five-Year Plan, China is moving faster to upgrade its growth model and speed up economic and industrial restructuring. To be specific, efforts have got underway to promote consumer-driven growth and strengthen technology innovation. Our central objective is to pursue resource-efficient and environment-friendly development and achieve coordinated, balanced and sustainable growth. As part of this overarching initiative, the Chinese government encourages more foreign investment to flow to modern agriculture, services sector, hi-tech industries, advanced manufacturing, new energy sectors and the vast inland areas. My Government supports foreign businesses creating R&D centres in China and bringing in more advanced technologies and human resources. These steps will open up new space for foreign investment in China. A key example of how our pro-investment policy is gaining traction from the business community is that many foreign companies are increasing investment in China. These include such big names as Tesco, Burberry, BP, HSBC, Standard Chartered, Walmart, Nike, Citibank, Carrefour, Alstom and BNP Paribas. I also draw your attention to a recent survey by the German Chamber of Commerce in China. This report suggests that around 90 percent of German companies operating in China will expand investment within the next five years. Over half of them will open new branches or plants. More important, an average of over 100 new R&D centres are being set up in China by multinationals each year. Second, opportunities from an improved investment climate. · Our legal infrastructure, policymaking and market environment are becoming more open, transparent and fair. · The Chinese government has cleaned up over 2,300 laws and regulations, bringing our legal practices in economic affairs more in line with China's WTO commitments. · China has cut its general tariff levels to 9.8 percent, way lower than the average of the developing world. Also China has removed all of the import quotas and certificates and other non-tariff measures. · China has liberalized the international trading rights and lowered the threshold for foreign capital. Meanwhile, we have opened up 100 sectors in the services trade. These are close to the level of the western countries. · China has made intellectual property protection a national strategy, and developed a sophisticated legal system and law enforcement to provide protection. · On innovation and government procurement, all foreign-invested companies are accorded national treatment in China, and the Chinese government treats all companies, Chinese and foreign, as equals. That summary paints a rosy picture of opportunity. But one point worthy of attention is that as China's investment environment improves, the competition in the market is getting stiffer. This means all Chinese and foreign companies are on a level playing field. All players will need to compete to survive and thrive. That's why, to succeed in China, foreign businesses shouldn't pin their hope any more on special preferential policies or super-national treatment. Foreign business needs to adapt to the new market conditions. That means building up a competitive edge in brand, technology, quality and services. In addition foreign business in China needs to develop strong managerial and marketing expertise, protect workers' rights, take social responsibility and raise corporate profile. Now, the China-Britain commercial relationship is at a high point. The British government and enterprises highly value the Chinese market potential and seek to increase export to China. British export to China in the first three quarters has increased by 29.3 percent. That's faster than any of Britain's top 15 export markets. Now our two countries are working together to raise our bilateral trade to the goal of 100 billion US dollars by 2015. On the investment side, Britain has always been a leading EU investor in China in recent years. By last August, Britain's paid-up investment in China had reached 17.5 billion dollars. These investments span a broad range of sectors, including energy, finance, manufacturing and retail. Our two governments are forging ever closer ties. 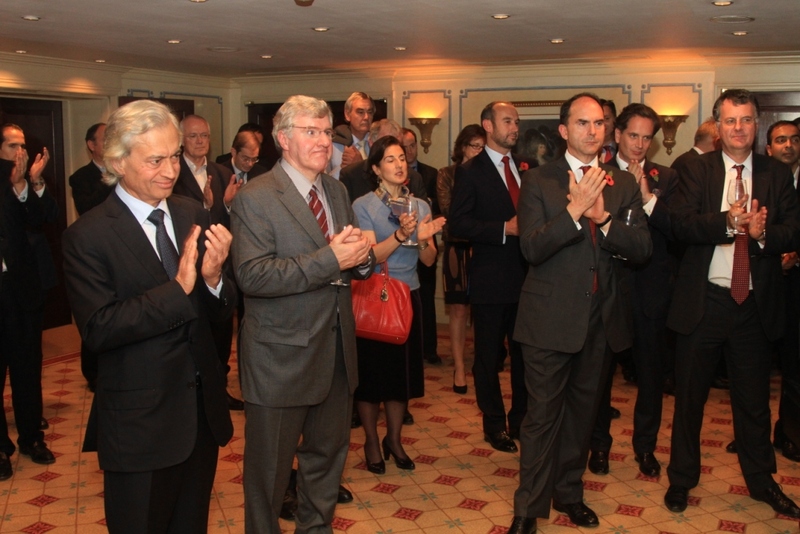 Two months ago we held the fourth China-UK Economic and Financial Dialogue in London. · Deepen two-way trade and investment. · Unlock cooperation potential in infrastructure, high-end manufacturing, new energy and environment-friendly industries. 'The trend is your friend'. Tonight I have sketched out some very positive trends. It's my sincere hope that the British businessmen and investors will follow these positive trends. There are clear openings to seize the opportunities to establish presence and invest more in China. This is a path towards a win-win future. I look forward to watching your remarkable success!